[A. C. Benson, Master of Magdalene College, Cambridge, poet, essayist and ghost story writer.] Autograph Signature ('Arthur Christopher Benson') on leaf from diary. On 17 x 12 cm leaf of thickish paper, removed from 'The Meredith Birthday Book'. In good condition, lightly aged and worn. Scratchy signature, underlined. In one of three printed boxes of red rules on one side of the leaf, the other side bearing quotations from George Meredith for the days 25 to 27 April. [A. C. Benson, Master of Magdalene College, Cambridge, poet, essayist and ghost story writer.] Autograph Letter Signed ('Arthur C Benson'), thanking an unnamed lady for the 'encouragement' of a 'kind & sympathetic letter'. On letterhead of Hinton Hall, Haddenham, Isle of Ely. 11 June 1907. 1p, 12mo. In good condition, folded twice. The recipient is not identified. Reads: 'Dear Madam, | I must send you one line to thank you for your kind & sympathetic letter, which has not only given me real pleasure but encouragement as well. It was good of you to write. | Very truly yours | Arthur C Benson'. [Hall Caine's brother Ralph threatens Lord Northcliffe's Amalgamated Press with legal action for 'stealing my idea' on popular publishing.] Two Typed Letters Signed from 'Ralph' to his 'Papa & mama', with his Typed 'complete [solicitors'] statement'. Letters on letterhead of 2 Tudor Street, London E.C. [Amalgamated Press Ltd offices] 15 March and 18 April 1907. Statement without place or date. The three items are in good condition, lightly aged. ONE: TLS, 15 March 1907. 4pp., 4to. He is sending a copy (i.e. Item Three below) of 'a complete statement of what has taken place up to date. In fact it is the actual statement I placed before my Solicitor this afternoon […] Of course this is what we might have expected from these people, and it does not come as a very great surprise. | It is a direct attempt to get out of their obligations, as they have done before, as they can get this new man, and have got him – at something like £500 a year without an interest'. [Hall Caine, novelist: studio portrait and signed autograph inscription.] Signed Autograph Inscription ('Hall Caine') to Lady Campbell Clarke, with print of studio portrait photograph. No place. 9 November 1905. An attractive item, in good condition, lightly aged and spotted. On one side of a piece of 17.5 x 25 cm landscape paper, with the autograph writing on the right-hand side and the 15 x 10 cm print of a studio portrait laid down on the left-hand side. Caine was a striking and instantly-recognisable individual, and the photograph shows him in characteristic style, bare-headed in his usual dress of long double-breasted coat with white cravat, staring intently at the camera, with a book in his right hand, and his right hand draped across his left thigh, his left leg being elevated on a chair. [Hall Caine and William Lestocq of Charles Frohman's: a playwright and his producers.] Typed Letter Signed from Lestocq regarding 'the whole matter of the prospects of "The Christian" tour', with Autograph Copy of Caine's response. 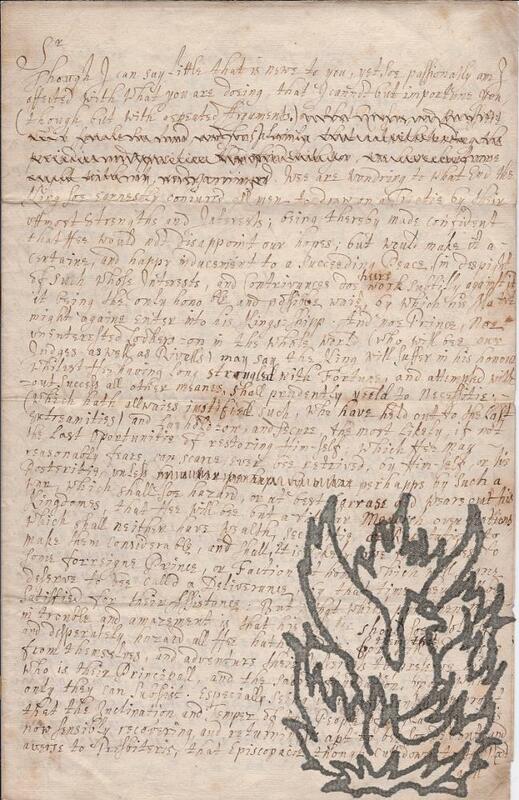 Lestocq's letter on his letterhead, Charles Frohman's, Duke of York's Theatre, London. 3 April 1900. Copy of Caine's reply daterd 5 April . An interesting exchange, casting light on manegerial practices in late-Victorian theatre. ONE: Typed Letter Signed by 'W. Lestocq'. 2pp., 4to. In good condition, lightly aged. A long letter, single-spaced. He has 'talked over the whole matter of the prospects of “The Christian” tour with Mr Frohman for next season, and he does not desire to send out a company on tour himself. Now I could of course let it on Mr Frohman's behalf or perhaps sell his rights and the production outright.' He gives details of his first choice if the latter course were pursued. [Hall Caine: business papers.] 21 items: letters from William Heinemann; R. Golding Bright (of Marbury's) and Ripley Hitchcock (of D. Appleton & Co); with legal and banking documents. London, New York, Manchester and the Isle of Man. Dating from between 1890 and 1907. The 21 items are in good condition, lightly aged and worn. ONE: ALS from HC's London publisher William Heinemann. 1 January 1890. 4pp., 12mo. 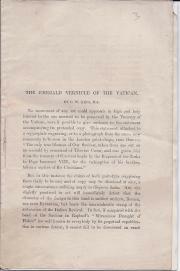 Regarding the 'draft of agreement', the printing of HC's book ('I shall of course announce it in the Athenaeum before & do all I can to “work the oracle” & to create a rush at Mudie's when the book is out. '), a visit he has paid to 'Mr Mudie'. TWO: TLS from R. Golding Bright, 'London Representative' of New York dramatic agent Miss Elisabeth Marbury. 4 July 1904. 2pp., 4to. With envelope addressed to HC at the Hotel Caspar Badrett, St Moritz. 3pp., 8vo. Bifolium with three pages of text, with title on reverse of second leaf (printed crosswise for folding into packet). In good condition, lightly aged and worn. The first page is headed 'Collier Dock - Isle of Dogs', followed by a list in two columns of the twenty-four directors, and solicitor's details. The 'Meeting of the Proprietors' was held at the London Tavern, Bishopsgate Street, 5 April 1827, and there was only one topic. [ Captain Basil Cochrane, Commissioner of Customs in Scotland. ] Autograph Signature ('Basil Cochrane') on an Exchequer pension receipt. 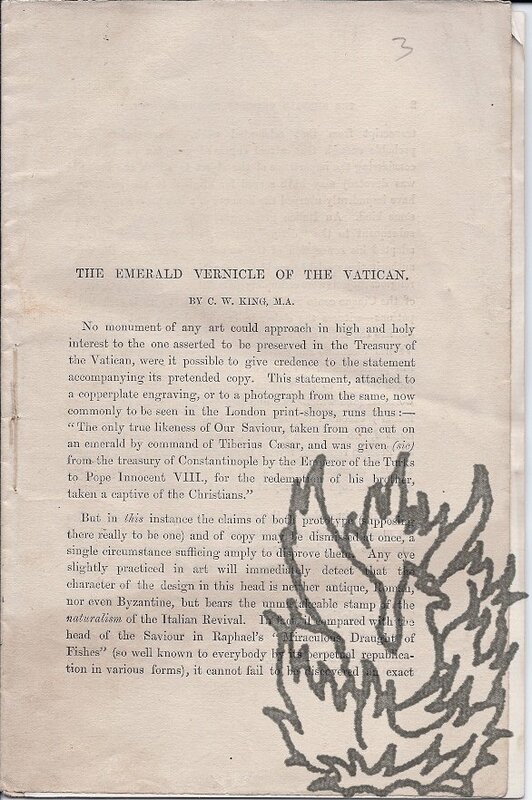 [ His Majesty's Receipt of Exchequer, London. ] 7 June 1788. 1p., 8vo. In fair condition, on aged and worn paper. With printed text, headed 'PENSIONS', completed in manuscript. Recording payment to him of £8 6s 8d. Signature at foot of witness 'A Dickie'. Signed within months of Cochrane's death, and a little shaky. [xxii].166pp., 8vo, original green front board with gilt decorated title, bumped but good condition, rebacked with new brighter green back board, contents sl. foxed and stained, mainly good, advertisement page for another book by Kennish (naval) and the poems of Harriet Jones. Eight page liist of Subscibers, inclkuding many inhabitants of the Isle of Man. Note: Re Preface, an "unlettered Poet", former ploughboy, trouble learning English when joining the Navy, etc. Scarce: copies on COPAC/WorldCat only copyright libraries. [ Edward Forbes, Manx naturalist. ] Autograph Note in the third person to 'Mr Bowerbank'. On 3 x 17 cm. slip of paper, cut from longer document. In fair condition, lightly aged and folded. Reads: 'Prof Forbes' compliments to Mr Bowerbank and he cannot they are not ready he will forward them to Mr Ransom himself'. [ John Frederic Gill, Second Deemster of the Isle of Man. ] Two Autograph Letter Signed (both 'J. Fred. Gill') to 'Miss Jull', regarding the arrangements for her to sing at a concert at the Grand Theatre, Douglas. The first on letterhead of Anfield Hay, Douglas, Isle of Man; the second from Douglas. 3 and 31 December 1896. Both letters 2pp., 12mo. Both in good condition, on lightly-aged paper, with tape from previous mounting adhering along one edge (and in one case overlapping a few words, including the signature). The two letters concern a concert 'at the Grand Theatre on 7 January', 'entirely of Manx music', in which the recipient has agreed to sing. Having put her down for two songs, he sends her 'our Book, out of which all the items of the concert will be taken', with suggestions of two songs and three encores. The second letter gives details of the rehearsal in Fort Street. 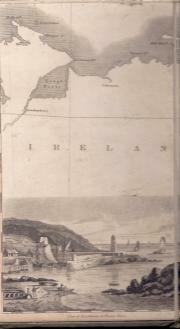 On letterhead of Rock Mount, St John's [amended in autograph to 'Peel'], Isle of Man. 12 December 1851. 3pp., 12mo. Bifolium. In good condition, very lightly aged. Harrison begins by answering the unnamed recipient's enqury 'about Manx Coins &c', with reference to 'an old bookseller in Douglas' and 'John F Crellin of Orrysdale'. Crellin has 'a fine Collection of Coins relating to the Island', and is 'in a poor state of health & confined to bed'. Harrison discusses a paper by Crellin on 'the Coinage of 1733' before turning to 'what duplicate' of Manx Society publications he has in his possession, 'chiefly of my own Editing'. [ Sir Thomas Henry Hall Caine, Manx author. ] Typed Letter Signed ('Hall Caine') to Manchester journalist and editor John Cuming Walters, regarding his book 'Recollections of Rossetti'. 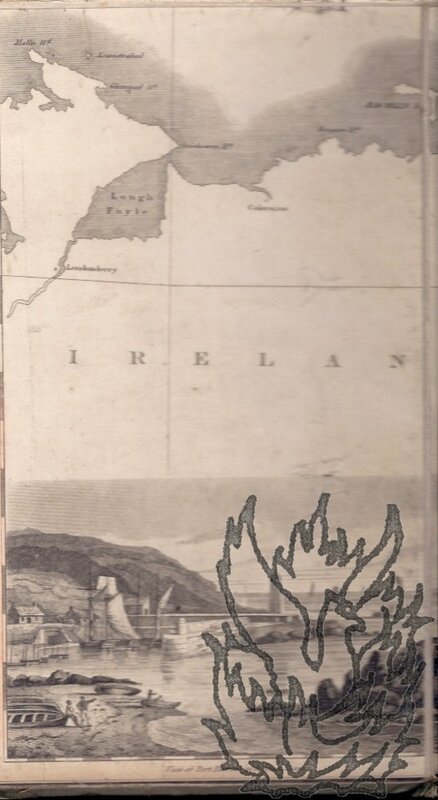 On letterhead of Greeba Castle, Isle of Man. 24 August 1928. 1p., 12mo. In good condition, lightly aged. He begins by noting that they have not corresponded for a while, and that he has 'been abroad most of my time for several years'. He is sending him 'a set of advance sheets of a little book I am to publish with Cassells at the end of September' ('Recollections of Rossetti'), 'because I have a very grateful memory of all the kind, appreciative and very able articles which you have written about other books of mine'. [ Henry Brougham Loch, 1st Baron Loch, High Commissioner for South Africa. ] Autograph Signature ('Henry B Loch'). On 4 x 9.5cm piece of paper. In fair condition, aged, and with rust staining from staple to left of signature. Autograph Signed corrected draft of 'Memorial of Major general Charles Viscount Grant de Vaux' to the Earl of Bathurst, requesting the transfer of a previous grant of land in Canada to his native island of Mauritius. Grant Cottage, King's Road, Sloane Square [London]. 21 January 1813. 2pp., cr.8vo (30 x 18.5cm). 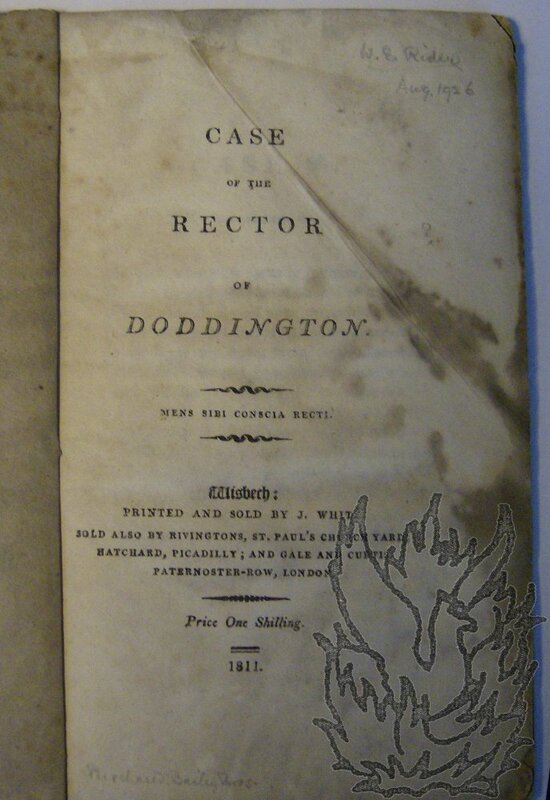 In fair condition, aged and worn, with slight damage to one corner, resulting in loss of one word of text. 62 lines of text, with deletions and emendations, and the thirteen lines of the conclusion largely rewritten. Headed: 'To the Right Honorable | the Earl of [sic] Bathurst | His Majestys Principal Secretary of State for the Colonial & War Department, | &c &c &c | the Memorial of Major General Charles Viscount Grant de Vaux | Shewest [sic]'. [Printed reports.] Run of reports of the Council of Education for the Isle of Man [Isle of Man Board of Education], 1911-1969, with copy of the 'Report of the Buchan School Commission. July, 1951'. All 56 items printed at Douglas, Isle of Man [Brown & Sons, Limited, "Times" Buildings; S. K. Broadbent & Sons, Limited; Norris Modern Press, Ltd.]. 1911 to 1967. 56 items, comprising an unbroken run of 53 issues from 1911 to 1963, together with the issues for 1967 and 1969, and a copy of the 'Report of the Buchan School Commission | July, 1951'. In two sturdy green cloth boxes ('Supplied for the Public Service'). All 56 items with stamps, shelfmarks and labels of the Board of Education Reference Library. The first eleven issues (ending in 1921) are more substantial than the rest, and are housed in the first box. [Captain Thomas William PIxley of Hill Lodge, Freshwater, Isle of Wight.] Album filled with unpublished autograph poems, mostly autobiographical and composed for recitation at Christmas, with family information, newspaper cuttings, printed ephemera. Hill Lodge, Freshwater, Isle of Wight. 1875 to 1884. 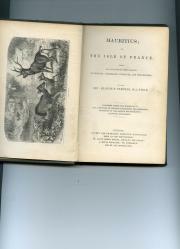 The autograph matter within the volume covers 206pp., 4to, with a further 14pp carrying newspaper articles and printed ephemera. In fair condition on aged paper, with some leaves loose, in damaged and worn quarter-binding with marbled boards and leather spine. Large armorial bookplate of Thomas William Pixley laid down on front board. Captain Thomas William Pixley (1819-1891) of Hill Lodge, Freshwater, Isle of Wight, commanded the 850-ton merchantman Essex (belonging to Messrs.
Castletown, Isle of Man. 1 January 1847. 1p., 4to. Thirteen lines of text, daintily printed in small type. On lightly-aged and creased paper, with a number of short closed tears. Dated in print at the foot 'Castletown, Isle of Man, | 1847.' Beneath this De Renzy has written, in manuscript, '1st January, | [signed] George Webb De Renzy, Major | and Barrack-Master'. Autograph Letter Signed from Hon. Rosa Hood, Lady in Waiting to Queen Victoria, informing Mrs Gye of the Queen's response to her letter denying authorship of an article in the Church Journal. With autograph draft of response by Mrs Gye, signed 'Be'. 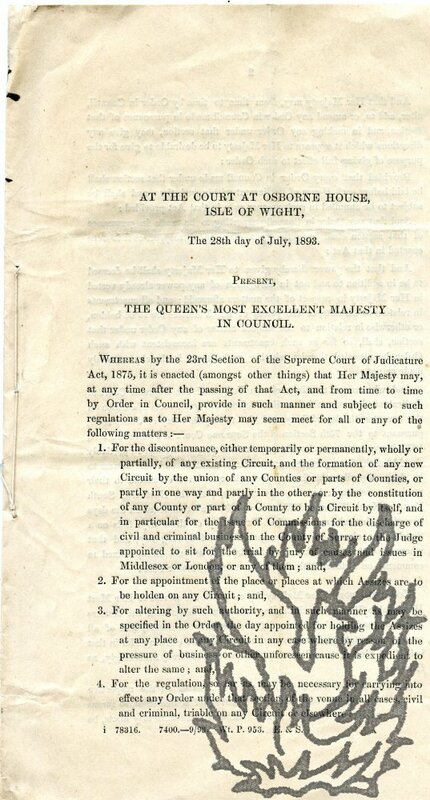 Hood's letter: On letterhead of Osborne [Isle of Wight]. 8 January 1891. Mrs Gye's draft reply: without place or date. Both items good, on lightly-aged paper. 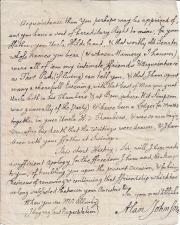 Rosa Hood's sister Adelaide Fanny was the wife of Herbert F. Gye, and letter and reply are written informally. 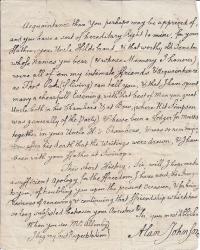 Hood's letter: 3pp., 12mo. 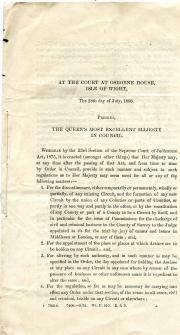 She received Mrs Gye's letter that morning, 'and the Queen has read it' and is 'quite pleased with your reply'. 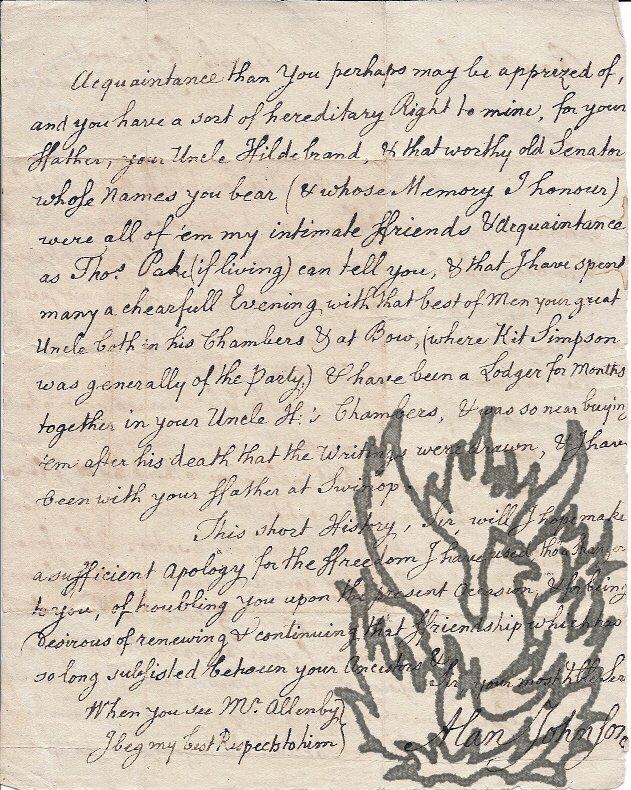 Alan Johnson (d. 1795) of Temple Belwood,c, Lincolnshire, to an unnamed 'Rev[ere]nd. Sir'. 'Temple Belwood near Thorne Yorkshire | 12 May 1788'. 8vo, 2 pp. 36 lines. Text clear and complete. Fair, on aged paper. Regarding a replacement for 'Mr Coggan', who is resigning the office of Chief Constable for the Isle of Axholme 'at the next Caistor Sessions'. Johnson has been 'for several years & down to the time of the new Commission o[f] peace the only acting Justice in the Isle', and expects 'some Regard' to be paid to his recommendation. He will 'give the Court some reasons which incline me to think that Mr. Gibbison ought to be preferr'd to his Competitor Mr. Gervas'. 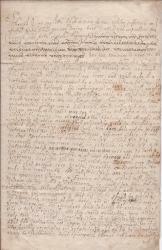 Anonymous Manuscript, apparently unpublished, docketed: 'Copie of a Letter to Sr Philip Warwick [secretary to King Charles I] assisting at the Treatie at the Isle of Wight Oct: 17th 1648', written a few months before the king's trial and execution. Folio, 3 pp. Bifolium. Printed on laid, watermarked paper. Around thirty-four lines to the page. Text clear and complete. Fair, on aged paper, with loss to one corner (not affecting text). Reverse of second leaf docketed, and with thin strip from mount adhering at fold. Written in a neat seventeenth-century hand, with a number of emendations (including a deletion of three lines) suggesting that this copy was made by the anonymous author himself. Pp.-12, sewn as issued, loose enclosure folder containing (loose) photographi of the image of Christ)( see COPAC for 24pp. pamphlet published by the Manx Society in 1872 - relationship with this unknown), some foxing and sunning of exterior, other marking, fair. With occasional annotation/correction in unknown hand. Autograph Letter Signed to R. Hollingworth of the Glen, Gurnard, Cowes. 30 March 1892; The Vicarage, Carisbrooke, Isle of Wight. 12mo, 3 pp. 39 lines. Text clear and complete. Good, on lightly-aged paper, with remains of stub from mounting adhering to one edge. Difficult hand. He thanks him for his reply to James's query 'in the local papers as to the family'. He is returning a book, apparently because the 'Authoress Mrs Traherne was also good enough to send me her book so that I am well supplied with copies of the volumes'. He finds that 'all the information from other sources [...] confirm [sic] the details of the history recorded in these Annals'. Printed Edinburgh Assize paper, a summons to be served to those accused of 'Mobbing and Rioting', 'Obstructing a Presbytery' and 'Assualt', in which Neave sets out the case against them. 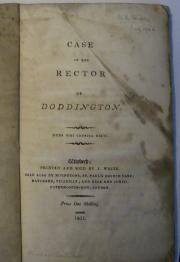 With 'List of Witnesses' and 'List of Assize. Edinburgh'. Ten quarto pages (paginated 1 to 10) on three loose bifoliums. Stabbed as issued. Text clear and complete. On aged paper with chipping and short closed tears to edges. 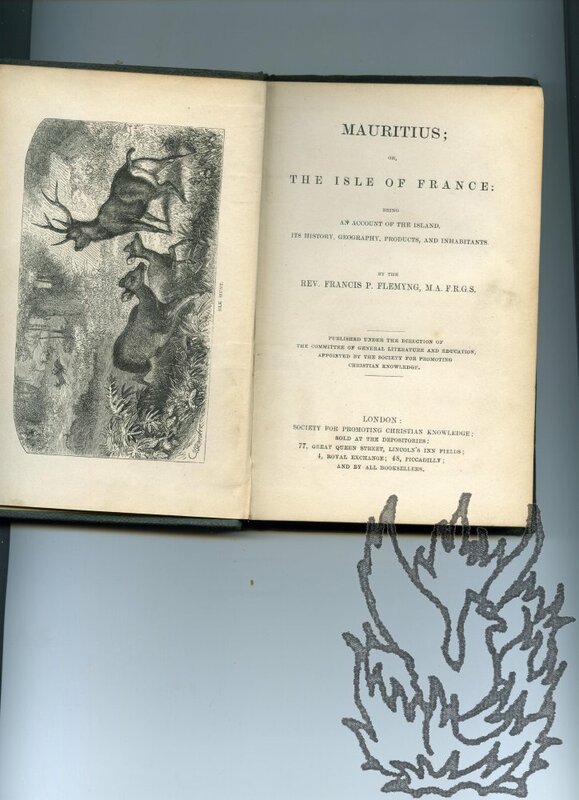 Mauritius; Or, The Isle of France: Being an Account of the Island, Its History, Geography, Products, and Inhabitants. 12mo: xiv + 256 + [ii] pp. Detailed fold-out map of the island, in black, blue and pink. Frontispiece and seventeen illustrations. A tight copy on lightly-aged paper, in worn original embossed green cloth binding, gilt. Map creased and with short closed tear. A nice copy of an interesting little book, bearing the bookplate of the botanist Mary Addison, to whom it was presented, according to an inscription on the front free endpaper, by the Reverend J. Hoding on 30 August 1867. A few neat synoptic notes in the margin, presumably by Addison. Four-page SPCK catalogue at rear. Three printed plans (numbered 1, 2 and 3) each entitled "Plan of Property in the Isle of Ely belonging to the Master, Fellows and Scholars of Clare College, Cambridge. To be sold by auction by Messrs. Bidwell & Sons. June, 1912." All three plans by Bidwell & Sons, Surveyors & Auctioneers, Ely; & 11, Benet Street, Cambridge. 1912. Each plan printed in black on one side of a piece of paper, with areas picked off in blue, green, orange, pink and yellow. Plan No. 1: 72 x 86 cm. Plan No. 2: 88 x 68 cm. Plan No. 3: 76 x 89 cm. The first two very good on lightly aged and creased paper; the third as the first two apart from some wear along a crease resulting in two areas of loss each roughly 2 1/2 x 1 1/2 cm. The various properties (over seventy lots) are numbered, with names of the proprietors of neighbouring estates given.